(Nanowerk News) Electrical engineers at Duke University have invented an inexpensive printed sensor that can monitor the tread of car tires in real time, warning drivers when the rubber meeting the road has grown dangerously thin. 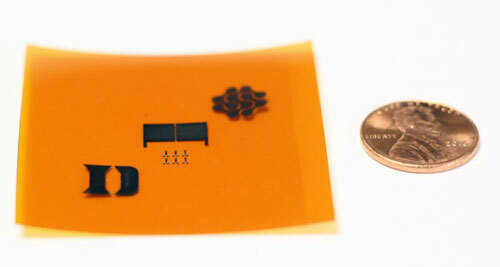 A demonstration of the printed carbon nanotubes on a flexible surface. The prototype tire tread sensor (middle) is flanked by the logos of Duke University and Fetch Automotive Design Group. In a paper published June 9 in IEEE Sensors Journal ("Noninvasive Material Thickness Detection by Aerosol Jet Printed Sensors Enhanced through Metallic Carbon Nanotube Ink"), Franklin and his colleagues flesh out their sensor design. 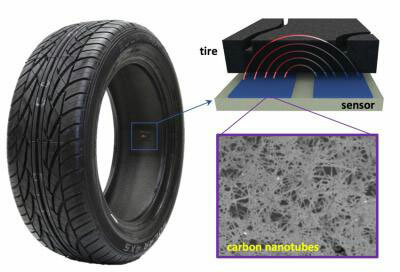 The sensors can be printed on most anything using an aerosol jet printer -- even on the inside of the tires themselves. And, while it is not yet certain that direct printing will be the best manufacturing approach, whatever approach is ultimately used, Franklin said the sensors should cost far less than a penny apiece once they're being made in quantity. Other tire tracking products have recently hit the market. For example, the tire company Pirelli recently unveiled a system to electronically track each tire -- when it was installed, how many miles it has gone, when it was last serviced, etc. -- and use an algorithm to estimate its wear and tear. While not the same thing as actively, physically measuring tire tread, it shows that the market is there for this type of information.